Welcome to Super Bowl Week: In honor of the nation's most overhyped athletic contest, the Bust is spending the week mocking some of the greatest Super Bowl champions. You're welcome, America. 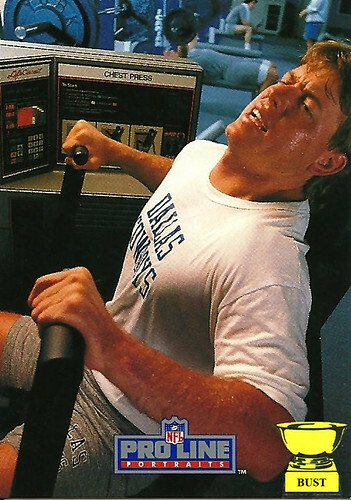 You're doing it wrong: Poor Troy Aikman. He never learned how to properly exercise. Sure, it was hilarious to watch him hit the weight room; he'd do handstands on the StairMaster, attempt leg presses with his teeth and run around with dumbbells tied to his ankles. Look how sweaty he is in this photo. Beads of perspiration are dripping from his red cheeks, his bangs and the tail of his pseudo-mullet. His shorts appear to have absorbed 13 gallons of what we hope is sweat. He looks like he's about to have a coronary. If only there were some sort of directions on how to use the chest-press machine!